Line flat baking sheets with parchment paper. If grinding your own almonds, sift them through a fine sieve. Re-grind any almonds that don’t pass through. Sift the ground almonds with the icing sugar. Make a French meringue: Whip the whites with the salt on slow speed until the whites begin to rise up the sides of the bowl. Increase the speed and gradually add the caster sugar. Add any optional food colouring now. Continue to beat until the meringue holds stiff peaks but is still shiny and pliable. Sift icing sugar and almond mixture into egg whites and gently fold in until completely incorporated. If the batter is stiff, continue to fold until the mixture is shiny and flows like magma. Stop mixing when small peaks dissolve to a flat surface. With a ½” or large round tip, pipe the batter into 1½” rounds, 1” apart, onto the baking sheets. Tap the underside of the baking sheet to remove air bubbles. Let dry at room temperature for 20 minutes or up to 2 hours to allow skins to form. Bake at 150°C for about 12 minutes. Open the door briefly after five minutes to let the steam out. When cool, carefully remove from the parchment with an offset spatula. Pair macarons of similar size, and pipe about ½ teaspoon of the filling onto one of the macarons. 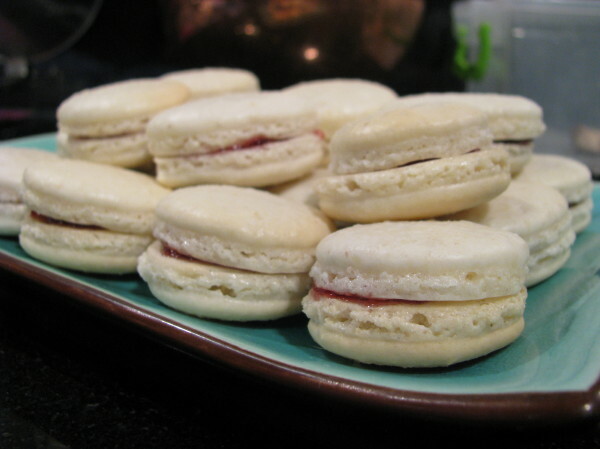 Sandwich macarons, and refrigerate to allow flavours to meld. Serve at room temperature. Chocolate: add 30g cocoa powder to the ground almonds. Add 4 drops red food colouring to the meringue before mixing in the almond mixture. Fill with ganache. Coffee: Mix in 3 tbsps instant espresso dissolved in 1 tbsp water (when adding the almond mix). Coconut: Replace 170g of the almonds with 170g unsweetened desiccated coconut. Sprinkle the macarons with coconut before baking. Fill with lime curd. Oh, This is one of my favorite snacks/desserts! MACARONS! :D…I would like to try this French macarons, too!